"Supreme Challenge Series: 1 Mile, 5K and Marathon"
This was the first year the race had a challenge series. 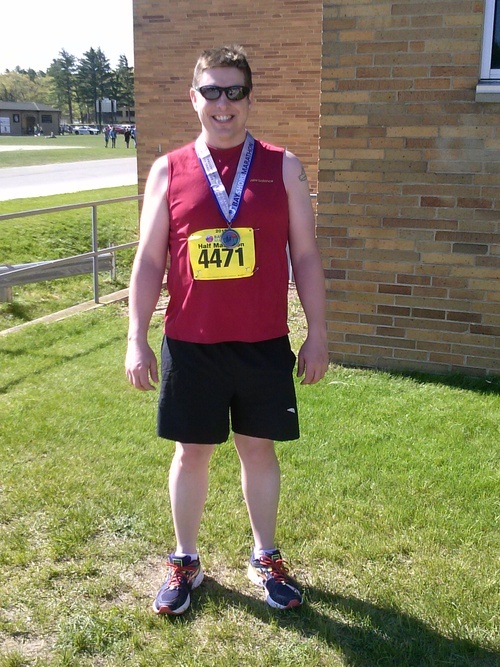 There was the Supreme (1 mile, 5K, Marathon), Wonder (1 mile, 5K, International Half Marathon) and Temptation (1 mile, 5K). I signed up for the Supreme Challenge. This would only be my second marathon and I wanted to make it special. The expo was well organized. You enter the expo and the first area you come to is the packet pickup. From having run this race before, I had my enhanced driver's license with me so I could pick up my packet. You need to have a passport or enhanced driver's license with you to pick up your packet IF you are running the Marathon or International Half Marathon. At the end of the expo, at the RunDetroit booth, there was a video showing what the course looks like. I really like this idea. This helps give runners a quick visual look of the course and maybe help give some landmarks to look out for during the race. The 1 mile and 5K are on Saturday. Both races are held at the same location. If you ran one of the Challenge Series races, you get the finisher medal for both races. The Marathon was on Sunday. Both Marathon and International Half Marathon runners start at the same time. The course takes you over the Ambassador Bridge to Canada and back to the USA through the Windsor Tunnel. Once you cross the half way point and break away from the half marathoners, there aren't as many runners, but there still are people along the course cheering you on. Overall, I would recommend this race. It's well organized. There are plenty of fluid stations along the course. The course is well marked. It's the only day where you can run a mile under water, crossing international borders (through the Windsor Tunnel). "The Great Pumpkin Run: Tough Pumpkin Challenge"
The Great Pumpkin Run 5K was held at Uncle John's Cider Mill in St. Johns, Michigan. I opted for the Tough Pumpkin challenge, where you carry a pumpkin with you the entire 5K. The one I selected was 13 lbs! The course takes you through the woods and is all dirt, gravel, or grass the entire course. For completing the 5K race, you get a finisher's medal. 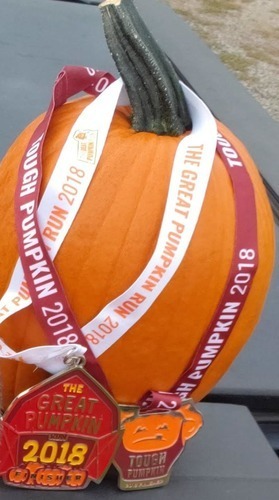 For those who ran the Tough Pumpkin challenge, there was an additional medal. This was a really fun race and I definitely recommend it to others looking for a fun fall race. "Fast course with beautiful scenery!" This was my second time running this race. I wanted to run it again because it's really well organized and you can't beat the scenery. Almost the entire course is along the waterfront. There are a lot of people that line the streets to help cheer you on. Some people hand out water, have their sprinklers on, or even hand out beer. The finish is on a track, where people are in the stands helping cheer you on across the finish line. Highly recommend this race. There is a reason it sells out within minutes. It's that good! "Flat & fast course that takes you through Metro Beach"
This was my first time running this race. i heard about the race from the local newspaper. I wanted to run this race because I ran parts of the course many times when I first started running. It would be my first race back in my hometown. The race is a small race, but well organized. The course starts out in downtown Mt. Clemens, and you run towards Metro Beach. On your way out of Metro Beach is the half way point of the course. The final part of the course has a lot of turns which helps makes it fly by. There is a small incline right before the finish line, but it isn't bad. If you're looking for a small, well organized half marathon race to run, look into this race. I highly recommend it. I really enjoyed this race. It's a fast flat course that takes you through campus and keeps you on the River Trail. The course was well marked and had a good amount of course marshalls to help direct runners and cheer us on. There isn't as many people cheering you along as with other races. A lot of that has to do with us running along the River Trail.